Often in art and theater, performers and artists reach within themselves to present their audiences with a picture of aestheticized pain. “4.48 Psychosis,” based on a script by Sarah Kane, is one of the most vivid and gruesome theatrical depictions of inner pain ever performed. Presented by the Students’ Experimental Theater in collaboration with the Berkeley Art Museum & Pacific Film Archive, or BAMPFA, the work chronicles a deeply personal look into the mind of someone who is suicidal — something that English playwright Kane struggled with throughout her life. Kane is said to have woken up consistently at 4:48 a.m. every morning — throughout the play, these awakenings are called moments of depression, insanity and clarity, but they provide no structure of which to speak. The performance defies concise summarization and feels more like a collection of poetic vignettes than a traditional narrative piece. The script of the play was published without characters, stage directions or any consistent formatting. It was the responsibility of director Baela Tinsley to create characters and a narrative from Kane’s source material, with Josephine Chiang as Patient, Theo Foley as Doctor and Kevin M as Narrator. Ultimately, however, each character seemed to serve as different representations of the self. 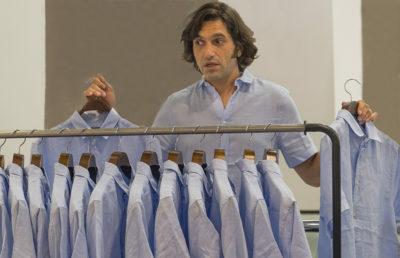 Throughout the show, the actors used their bodies as instruments to represent the layered self. Foley was tense, stiff and calculating as his character engaged in a chess game of sorts with his suicidal patient. Foley’s even and level tone made his few moments of anger and sadness scream to life. In contrast to Foley’s performance, M shifted slightly from foot to foot. Speaking softly in poetic prose, he seemed at times to be floating and almost angelic. And finally, Chiang served as the show’s heart and center, grounding the dreamlike production firmly in reality. The actors, however, were forced to fight against its surroundings at every moment. The work was staged in the large, open space in BAMPFA that is normally occupied by multicolored blocks to sit on while waiting for Pacific Film Archive’s movies to begin. The large space, with white walls and concrete floors, also has a huge picture window, allowing passersby the opportunity to peer down from the sidewalk and see what is happening below. The horror and seriousness of many of the lines were undercut by a janitor rolling a trashcan or a group of girls walking past, pointing and laughing down at the performance. Softer nuances seemed to be swallowed up and lost by the location, and attention was difficult to keep with so much happening adjacent to the stage. 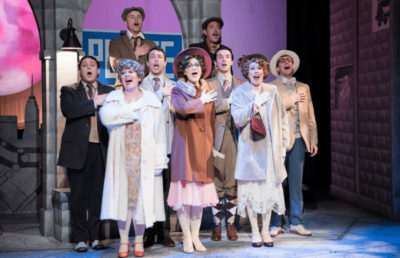 An article published about the original staging said that at the final line — “Please open the curtains” — the roof of the theater opened to the night sky and sounds from the street rushed in, reintroducing the audience to the outside world. In this staging, however, the outside world was inescapable — the audience could always see and hear the world continue to carry on around them. While as a work of theater the show suffered because of the space, the specifics of the surroundings did highlight an interesting tension between audience, mental illness and theater. 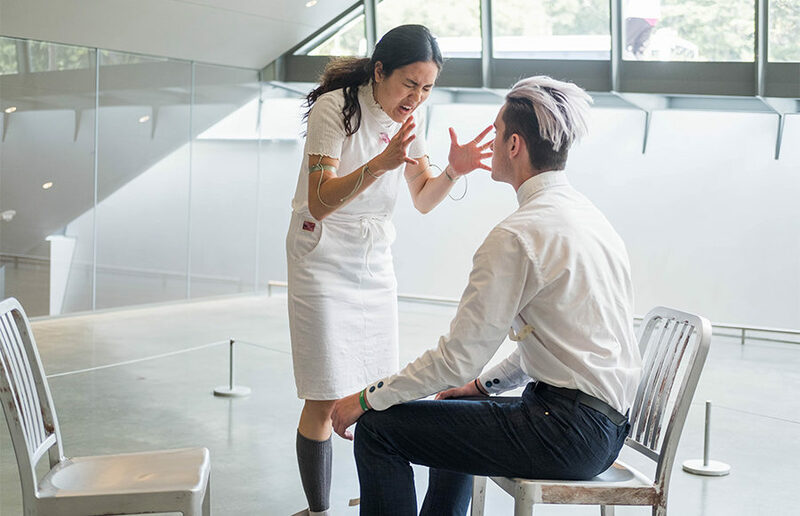 To have an actor scream, “I fucked small children while they begged for mercy,” while a janitor waits patiently for an elevator and people wander aimlessly around the gallery highlights the isolation of living with mental illness. With the actors clad in white costumes, they blended in with the huge room and its background noises, almost disappearing entirely — as if they hadn’t spoken at all. But at the end of the day, without the distractions of the staging, the show still presents emotions difficult for everyone to digest. It is easy to become removed from pain when it is on a canvas or a stage in front of you. So much art is born out of overwhelming pain that to feel it all fully would be to resign yourself to a life of anguish. “4.48 Psychosis,” however, demands to be felt, and despite loud outside noises or passersby, it deeply and astoundingly is. Contact Kate Tinney at [email protected].